This page hosts everything there is to know about Disney Cruise Line discounts, how to save the most money, and how to get the most out of the money that you do spend. CURRENTLY EXPIRED, but this is a Discount Favorite that comes back at least once a year: 50% Off Your Deposit – If you book your next cruise by February 15, 2017, only 50% of your initial deposit is required at the time of booking your itinerary. This offer is valid on any new reservation for a 7-night or longer Disney Cruise departing between June 17, 2017 and December 30, 2017. The remaining balance of the deposit is not due until your final payment. There are various ways to received on-board credits and they can be used for anything you purchase on board, incl. gratuities and port adventures (shore excursions). Travel Agent Credit – For your first cruise, your travel agent will typically offer an on-board credit just for using them, somewhere between $200-300. If they don’t offer that voluntarily, simply ask. Disney Booking Credit – For each subsequent cruise, Disney offers a $100 credit for cruises 6 nights and shorter, and a $200 credit for cruises 7 nights and longer. You receive this credit by booking your next cruise while on-board your first cruise (see next section). Disney Visa Credit – If you have a Disney Visa Card from Chase and you pay your full vacation with this card, you receive a $50 on-board credit for that cruise. Note that you will not receive this credit when receiving a Disney booking credit (see section above) that’s greater than $50. So you want to make sure to use your card for your very first cruise or one not booked on your last cruise. When I planned our first cruise, I thought it was a once-in-a-lifetime adventure given the price I had paid for a peak season Thanksgiving cruise. I couldn’t have been more wrong! By mid-cruise, Day 4, I was absolutely most certain beyond the shadow of a doubt that we would be back. Because Disney Cruises really are THAT amazing! That’s when I learned that if I book my next cruise while still on the ship, I get a $200 on-board credit for my next cruise, AND a reduced deposit, AND 10% off. You don’t have to know exactly what cruise you want to go on (even though you can book a specific cruise if you like), you simply book a “placeholder cruise.” This is a dummy cruise that you have 2 years to convert into a real cruise – whichever one you choose. At the time of booking this placeholder, all that’s required is a $250 deposit that counts toward your next cruise. And if you end up not taking it after all, you get reimbursed. When booking your next cruise, Disney will apply 10% off to your total amount, unless you’re booking a rate that already includes a special discount or a guaranteed room (since that is an implied discount). Often, taking the 10% on a better category room over a guaranteed rate is a better deal. To book your next cruise on board, you simply go to the reservations desk on board in the Atrium vicinity. I highly recommend not waiting until your last day when you will encounter long lines to make your reservation. They have all your information and credit card on file, and they also have your travel agent attached to your records. This whole process will take no longer than 2 minutes unless you have questions or want to book a specific cruise with specific room reservations (in which case you can still use your travel agent for any follow ups). During my last two cruises, I’ve found that the Disney system did not properly inform my travel agent of my placeholder booking and she couldn’t follow up with me or Disney. I recommend forwarding the confirmation Disney should have sent you to your agent upon your return home to make sure your agent is in the know and knows how and when to help you. There is really absolutely no risk in booking a place holder, but only benefits! I would most definitely recommend you do that. Getting a Disney Visa Card really does pay of. When you first open the card, you receive a $50 or $200 statement credit that you can immediately apply toward your first vacation. Your receive a $50 on-board credit when using your card to pay for your vacation in full. You are able to finance your vacation for 6 months without paying any interest and without a early pay-off penalty. And while that doesn’t save you money per se, it might make a more expensive cruise possible for you. Or it’s simply nice not to have thousands of dollars come out of your account all at once! Chase has 2 kinds of Disney Visa cards: One with and one without an annual fee. The annual fee is $49 and gets you a $200 statement credit. The one without the annual fee gets you the $50 statement credit. The main difference is that the annual fee card gives you 2% back on purchases made at gas stations, grocery stores, restaurants and most Disney locations. These are called Disney Dream Reward Dollars and you can apply them in full toward your next vacation (or anything else Disney) even if you financed your vacation on the 6-month plan and it isn’t paid off yet at the time of travel. If you are a Florida resident, you’re in luck! Disney offers, on an almost ongoing basis, discounts on Caribbean sailings for those residing in the Sunshine State. Halloween is on Sale! – The Halloween on the High Seas cruise departing on September 4 is on sale for Florida residents! The 4-night Caribbean cruise on the Disney Dream out of Port Canaveral currently sells for $1,520 for 2 (and that’s your 2 paying adults). Add on your kids, and it’ll be very little extra cash. This is for a category 7A stateroom, which are the Navigator’s verandas. Oh the Dream, they are much nicer than on the Wonder and Magic, and you will have a plexiglass wall and be able to see the ocean while sitting down. This deal is really worth it! * Halloween is on Sale for military members, too! – The Halloween on the High Seas cruise departing on September 4 is on sale for Florida residents! The 4-night Caribbean cruise on the Disney Dream out of Port Canaveral currently sells for $1,520 for 2 (and that’s your 2 paying adults). Add on your kids, and it’ll be very little extra cash. This is for a category 7A stateroom, which are the Navigator’s verandas. Oh the Dream, they are much nicer than on the Wonder and Magic, and you will have a plexiglass wall and be able to see the ocean while sitting down. This deal is really worth it! 7-Night Halloween on the High Seas Bahamian Cruise from New York with Marvel Day at Sea on October 14, 2017 – Pack your best disguises and set sail on a ghoulish cruise to Castaway Cay in the Bahamas and Port Canaveral, Florida, where you’ll discover even more Halloween action at the Walt Disney World Resort. During your 4 days at sea, you’ll have the chance to soak up your ship’s onboard fun. 8-Night Very Merrytime Bahamian Cruise from New York with Marvel Day at Seaon November 18, 2017 – Glide over to Nassau in the Bahamas and Castaway Cay, Disney’s private-island paradise. Then, call upon Port Canaveral, where you’ll travel to nearby Walt Disney World Resort. Four total days at sea give you ample time to enjoy your ship’s diverse amenities and yuletide celebrations. New York Cruise Discounts for Everyone! 4-Night Halloween on the High Seas Canada Cruise from New York on October 2, 2017 – Escape to the unspoiled beauty of Saint John and discover the many galleries, shops, restaurants, nature trails and all this magnificent maritime hub has to offer. You pay $1,088 per person, based on double occupancy. 7-Night Halloween on the High Seas Canada Cruise from New York with Marvel Day at Sea on October 21, 2017 – Experience the cultural hubs of Canada at Charlottetown, Sydney and Halifax. You pay $1,960 per person, based on double occupancy. 7-Night Halloween on the High Seas Bahamian Cruise from New York with Marvel Day at Sea on October 28, 2017 – Visit Disney’s private island, Nassau, and Walt Disney World Resort (includes one-day tickets with Park Hopper Option and round trip transportation). This is the first cruise that includes a Disney World Resort trip, so it’s a nice convenience built in! $1,512 per person, based on double occupancy. 8-Night Very Merrytime Bahamian Cruise from New York with Marvel Day at Sea on November 18, 2017 – Visit Disney’s private island, Nassau, and Walt Disney World Resort (includes one-day tickets with Park Hopper Option and round trip transportation). $2,240 per person, based on double occupancy. Regardless of how much research you do, it’s still nice to have an agent. They won’t make a mistake because they’re trained, and if they do, it’s not your fault. They price-watch for you and find the best deals for what you want. On our third cruise, my agent found me a rate that was not available on the Disney Cruise Line website to the general public and I saved a few hundred dollars because of that. Most importantly: You do not pay anything extra for using a travel agent. They are paid by Disney, you simply reap the benefits. It’s really a no-brainer on whether or not you should use an agent. I would, however, pick wisely who you work with as the attitude of an agent makes or breaks your planning experience. There are various travel agencies that specialize in Disney travel and they are approved by Disney – look for them. One much quoted agency is Small World Vacations, so I contacted them first. I was connected with the rudest agent who very clearly couldn’t have cared less about me and just wanted to make a quick commissions check. I asked her to get on the phone with me to explain the process and she was annoyed by the mere mentioning of taking up her precious time with a phone call. I instead went with Mouseketrips where they were appalled by such behavior, was connected with the most pleasant lady, and have used this same agent ever since my first cruise. There are several ways to get a better stateroom category than what you pay for. Here are all the tips and tricks. The earlier you book, the better your chances at realizing these. Book a Guaranteed Stateroom – When Disney is looking to fill rooms, the easiest way for them is to sell the lowest priced rooms. In order for the lowest priced stateroom categories not to sell out too quickly while higher categories remain unsold, Disney offers something called “guaranteed rooms.” When booking this category, you are guaranteed a predetermined category, but chances are that you will get an upgrade to a higher category. You pay a set price, usually at the regular rate for the guaranteed room category, or very slightly above it, but you don’t get to choose your stateroom. You basically get a great price for letting Disney decide where you will be on the ship. Make sure you don’t book this category if you wouldn’t be happy with the category offered at minimum, because there is no guarantee that you’ll get an upgrade. Chances are, though, that you will, as the lower rooms sell out all by themselves. Upgrades for guaranteed rooms are, therefore, more likely to happen on cruises that are expected to be relatively full, or close to capacity. We booked a guaranteed room on one of our cruises and got upgraded 2 categories, from a Navigator’s Verandah (the smallest balcony with the most white wall to a Restricted View category, which was basically a regular verandah). Note that if you book a guaranteed room, you will most likely not be able to use your 10% off discount from booking a placeholder cruise. The only time you might be able to use it is if your travel agent finds you a guaranteed category that’s not published for the public (and again I say: Book through a Disney travel agent!). Book a Secret Porthole Room – There are a few rooms categorized as an inside cabin , but they have an outside porthole. 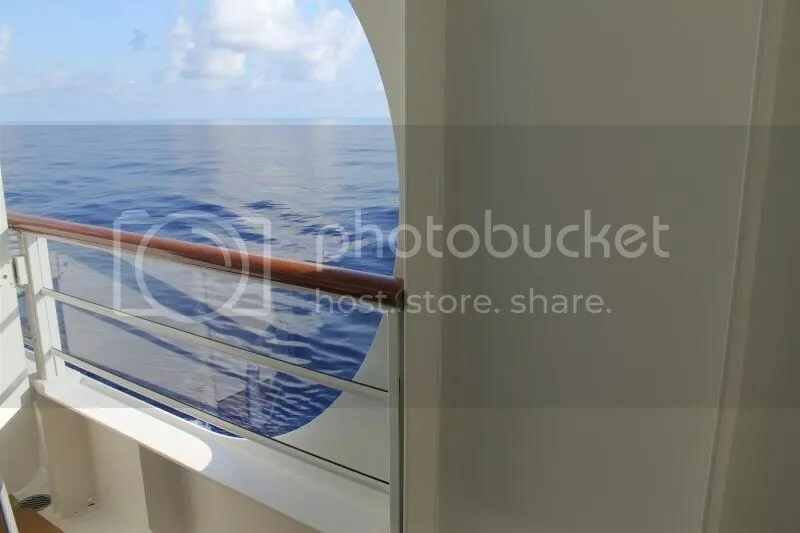 This porthole has obstructions on the outside, mostly equipment, but you will have at least a partial view for the price of no view. These rooms are only available on the Wonder and the Magic, but not on the Dream and the Fantasy. Book early if you want one of these because they sell out fast! The secret porthole cabins are 6006, 6506 (least obstructions with sky mostly blocked), 5020, 5520 (fairly blocked for all angles), 5022 (quite blocked) and 5024 (most amount of obstructions), 5522 (quite blocked) and 5524 (most amount of obstructions). The last 4 cabins are also connecting rooms, which is a nice alternative to paying for a larger room, and this way, you have even more space and double the bathrooms. Book a Secret Verandah Room – These rooms are categorized as category 7 Navigator’s Verandah rooms, so it’s not really a secret that there is a verandah, but you are really getting a regular category 5 or 6 verandah room. These rooms have very minor obstructions; there really isn’t much of an obstruction at all. You are basically getting a category 5 or 6 regular verandah, but you’re only paying for a category 7 Navigator’s Verandah. That will save you a few hundred dollars right there. All these verandas have an all plexiglass wall, or an almost-all plexiglass wall and you will be able to see the ocean sitting down. The only exception to this are rooms 5024 and 5524, which have most obstructions on the bottom half, so you will actually not see the ocean when sitting down. Because the verandah next door is also extended, your neighbors have full view of your verandah. Rooms 5024 and 5524 have no obstructions, but very small verandahs with no room for chairs. They do have a build-in bench, but don’t expect to comfortably sit out there next to your spouse to relax. The Magic and Wonder only have a handful of these rooms: Stateroom 6134, 6634, 7120 and 7620 with very minor obstructions on all of them. Note here: We were personally in stateroom 7182, which has the most amount of obstructions and is basically a Navigator’s Verandah. This saved me almost $1000 on a Thanksgiving cruise. Even so, we had a wonderful view, it was just not a view over the entire length of the balcony; almost half the front of the balcony had a full wall. So we scooted over. Done. Like the secret porthole rooms, these rooms sell out fast, so book as early as you can! Book a Navigator’s Verandah Room – This is really the best advice I can give anyone who wants a verandah and encounters that the secret verandah rooms are already booked. On average, you can save between $500-$1000 per room by booking this category 7A room – the Navigator’s Verandah. 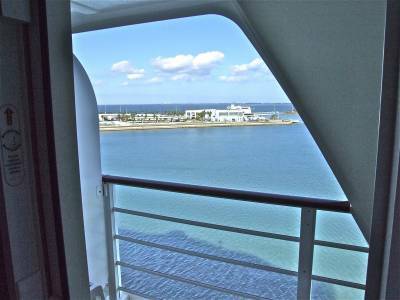 You will be in a regular verandah room, it looks exactly the same on the inside, but the room is in a location of the ship with an outside white wall that restricts your view from your verandah. This white wall wraps around the bottom of the verandah over the side(s) and over the top. On the Disney Magic and Wonder, these rooms have an almost enclosed balcony with a big open porthole, and a built-in bench, so they’re marginally better than a regular porthole; you still get the fresh air and you can stick your head out! Note that when sitting down, you will not be able to see the ocean. So if you are like me and like sitting outside with your hot coffee in the morning, relaxing, and looking out on the vast ocean – do not get this category. You will hear the ocean, but will have to stand up to see it. On the Disney Dream and Fantasy, the Navigator’s Verandahs are much more open, resembling a regular verandah. The bottom third of the plexiglass wall is a white wall (which I actually like because you can put your feet up! ), and the sides and tops have restricted views. In all of them, you see the ocean while sitting down and enjoy the breeze and sun coming in. Upgrade at the Port – This is a very risky way to cheaply upgrade your room, and you should only use this trick to get an “even better” category. Don’t book an inside room, which you know you will hate, and wait to hopefully get an upgrade to a verandah room at the port. Here is how upgrades at the port tend to go: You get to the port through the Magical Express (so that they will let you in to the port at any time and not only at your predetermined time if you arrive by private transportation). You will take the first seat all the way in the front on the first bus that leaves Orlando airport to go to the port. Don’t be on the second bus, it must be the first bus. When you get to the port, you do not stop for pictures or to go to the bathroom, but you run inside straight to the check-in line. You get to the check-in line as quickly as you can, you check in as quickly as humanly possible, and you mention immediately that you want to upgrade. After you are checked in, the attendant will send you to the desk that handles upgrades. You run there, you don’t walk! And you pray that you will still get an upgrade. Even though you thought you were the first person at the port. That was our story. We did exactly as described above and we got the 2nd-to-last upgrade. Families that had arrived only 5 minutes after us were out of luck. So again I say: Don’t book a room that you know you won’t be happy with hoping for a port upgrade. It might well not happen.